Client Catches – The red-letter day! I’ve written a few articles recently in relation to the annual invasion of sprat and mackerel around our shores (see here and here), in addition to the tactics I employ and the lures that I use to catch the increased numbers of bass that intently ‘follow’ the baitfish around the coastline. However, although an increase in the amount of bass may seem absolutely marvelous, it can actually serve to complicate things a little – let me explain. Firstly, lots of small bass (sub-1lb) in the vicinity can have the effect that the larger ones (who are more lethargic than their livelier siblings) don’t always ‘get’ to the lure first. Secondly, the warmer sea temperatures at this time of year serve to amplify the metabolism of the bass that, in turn, combine to encourage them to swim and hunt over longer distances and ultimately, wherever the abundant food (mackerel, sandeel and sprat shoals) are located. During a number of sessions, both with clients and those rare evenings that I’ve headed out alone, I/we have either been inundated with hookups and bass landed from the word go, or have had to work extremely hard and traipse long distances to succeed – with the odd very nice bass landed amongst what was primarily ‘smaller’ ones throughout August and into the first week of September. “If we find them, you’ll catch quite a few,” I said as I assisted brothers Adam, Paul and Simon with their equipment before the four of us set off to the venue I’d earmarked as a potential ‘zone’ in which the baitfish and bass would be ‘working and waiting.’ Tucked out of the main flow of a fierce tide-race, the mark I’d chosen as our first port of call is a series of rocky platforms leading onto a slanting (seawards) expanse of reef swept by the tide on its outer edge. Two other components about this mark stand out however. Firstly, within the reef is the odd pinnacle of armchair-sized rock jutting upwards, in addition to various clefts and crevices – both of which afford the bass with a number of points in which to hold (cleverly sheltering out of the main current) in order to ‘pick off’ any less-athletic prey items unfortunate enough to be overpowered by the fast-flowing tide. Following a brisk 20 minute walk, as we peered over the cliff my heart started racing – the sea conditions looked, to me, to be about as ‘bassy’ as it gets – a green tinge to the sea, 1m of clarity, aerated water being pumped around the rocks and a gentle swell rolling up on the flooding tide. Blimey, I wish I’d been fishing!!! When you have three clients at your disposal (for want of a better phrase) it enables me (as their guide) to mix things up in relation to lure choice initially – so that the process of determining what the bass may be feeding upon or looking for can be expedited. Furthermore, there are times when I may place one client on a weedless soft plastic, one on a shallow or medium swimming diving minnow and the third client on a surface lure – it all depends on the conditions that we’re faced with, the terrain and depth of the water. I opened Paul’s lure box and immediately took a shine to the very shallow diving IMA iBorn 98F in the ‘Bora’ pattern (as it very closely resembled the baitfish that I knew were resident in the area and generally speaking, close to the surface) before asking for his permission to attach it to Adam’s lure clip. “Sure” was his response, although I did sense a slight reluctance considering he hadn’t used it himself yet! With Paul, I attached one of his brand-new Xorus Patchinko 125 surface sliders and the larger but similarly shaped and designed (copied) HTO Canine before proceeding to ask all of them to cast slightly to their right and up-tide – as this is the direction I expected the baitfish and bass to be travelling (with the tide). I’d barely finished demonstrating the use and action of the surface lures when Adam (the youngest of the three brothers) called out to say he’d latched into a fish – a lively bass of around 1½lb or so – which considering he’d only caught them on bait before was an excellent start. Next up, Paul managed a small one on his medium-sized ‘Patch’ (a lure that I like a lot incidentally) followed by another two for Adam – both of which ‘coughed up’ a small sandeel. But with Paul and Adam both adding to their tally (albeit with small bass), despite being sandwiched between, them Simon had only received one ‘follow’ on the surface lure. Therefore, I decided to swap him over to something that would ‘swim’ down to around 1m. Routing through his lure box, I uncovered what is a brilliant sub-surface lure, the IMA Nabarone in the Guradeiwashi pattern (IMA make some stunningly effective lures) which I subsequently ‘clipped on’ following a quick sharpening of his hooks (tut, tut Simon). Conscious that there were sandeel shoals and sprat being harassed in front of us (although not visibly so), just as high water approached and the tide slackened, I asked Paul to transfer over to a sub-surface lure and one of my favourite sandeel imitations – the Daiwa Shoreline Shiner Z120F SSR in the MT Ayu pattern. We then proceeded to clamber around a further 30m section of rocks so that he could target the outer edge of a rock protruding slightly more out into the flow. Nervous that my net was 30m away, on the third cast Paul received a sharp hit, followed by the rod bucking over and staying there! I simply didn’t have time to return to the others and collect it, but instead I encouraged Paul to ‘guide’ what was clearly a very nice bass (as it appeared 30cm or so beneath the surface with its mouth open and gills flared) into an area of quieter water so that I could grab the leader and gently persuade it onto our recently occupied plinth of rock. Yes! She was ours! The largest bass of the day (at close to 5lb) heralded the arrival of an overall better stamp of fish. If my clients weren’t already tuned into the action and surroundings this bass (that was, of course, safely returned in the video above) certainly got their attention, and within minutes Adam had added another one and Simon had also broken his duck while I was unhooking Paul’s beautiful bass. As expected, things went a little quiet over the high-tide period, during which we had a quick break and a snack before recommencing with the same lures attached as the tide turned – this is when it started getting silly! First up, Simon nailed a better bass of around 2lb on the surface lure that I’d swapped him back over to. Once the tide began to ebb the bass really switched on! Within minutes, Adam latched into something that was ‘fighting’ differently – the rod tip nodding in a slower, more jagged fashion signaling a fish that was staying deeper and utilising the quickening current to its advantage. As it approached I was ready and waiting with the net to scoop up what I believe is his PB at 3lb – brilliant! Well done Adam! A better one that really put a bend in one of the Savage Gear Salt CCS lure rods that my clients use here. With good numbers of good-sized bass nailing the lures off the top on almost every cast Paul returned from the scene of his ‘prize bass’ whereby he clipped on the Patchinko 125 and went about catching another near three pounder almost straight away. This was becoming a blitz of bass activity, and I was positively overjoyed that it was occurring while I had three great blokes fishing away in front of me. When a shoal of bass ‘tuned’ into hitting baitfish within your ‘zone’ are of a better average size the sport can be absolutely spectacular. A red-letter day and then some! A session like this had been on the cards for some time therefore, I was extremely happy that we’d unlocked the secret to their location on this particular session – and it was great that three clients managed to take advantage of it. The ‘complete’ predator. I love these fish so much! Up to until this juncture, Simon had been lagging behind somewhat in the bass catching stakes. 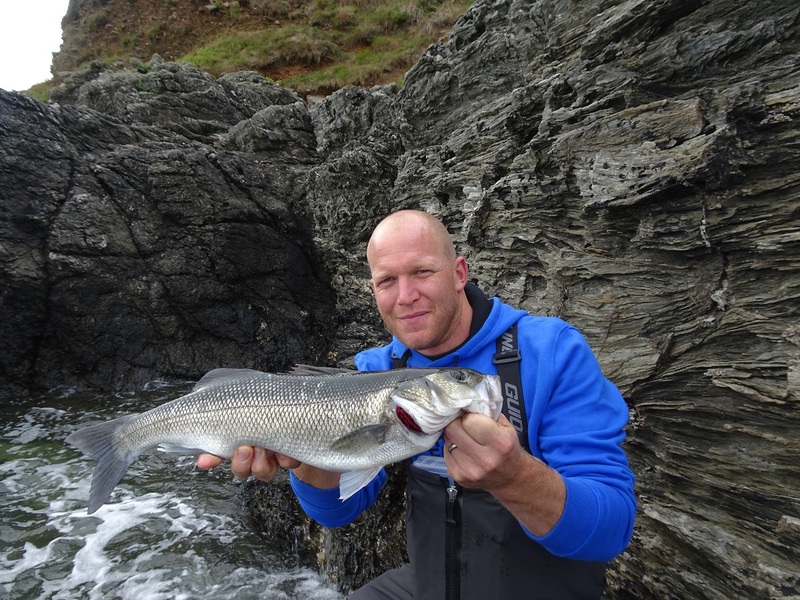 However, with his technique purring and the surface lure spitting, twisting and zigzagging right in the very noticeable strip of tide peeling off of the nearby headland, almost every single cast into this region resulted in a boil or splash within seconds – the fishing was that good! It was as I was stood with him that a better bass completely and utterly ‘destroyed’ the lure about 10m in front of us with a lunging crash on the surface – it was, quite possibly, the best view of this attack that you could ever witness and something you don’t forget. Well fed and fed up (at having its photograph taken with its captor) – this bass provided front row entertainment better than any cinema! 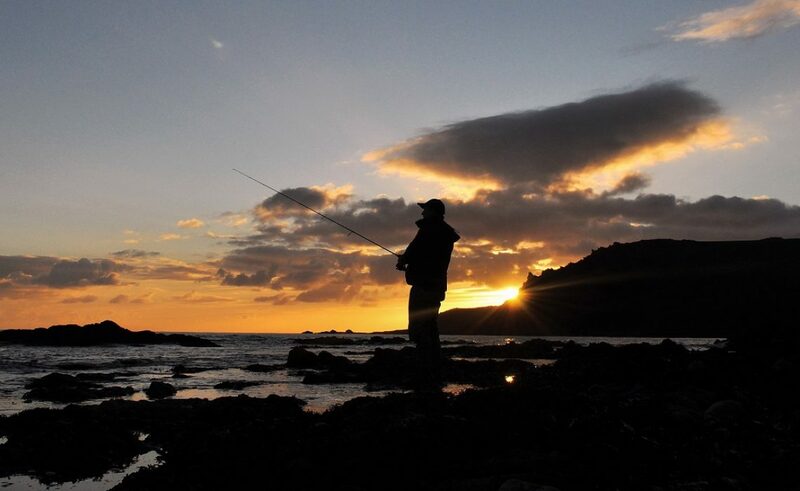 The bass kept on hammering the surface lures, particularly within that easily detectable column of the tide (depicted by an oily slick of faster-moving water) but with dusk setting in a decision had to be made. With Needlefish lures purchased, primed and burning away in their respective lure boxes all of them were extremely keen to sample how I fish these lures in shallow water covering rugged ground. Reluctantly, with only a couple of hours of the session remaining we decided to leave the bass to it (crazy I know!) and ventured out onto the south-west coastal path once more to a very secluded cove. With my clients briefed and the ‘needles’ sailing out into the gloom I expectantly traversed between the three of them in anticipation of ‘the shout’. But within the hour or so that they fished Adam had one good hit and only Paul managed to latch into and land one – which although small had brought the session to an extremely satisfying finale. When we totted up the numbers I believe it was Adam (13), Paul (9) and Simon (12) = 34 bass in total with the largest at close to 5lb and many over 3lb. When bass are in the mood they were in, it is one of few times in which you almost feel you can do no wrong – but these are rare events it has to be said. As mentioned, I was just glad that a) I managed to find the fish and b) that three anglers were able to enjoy what was close to being one of the most perfect sessions you could wish for! DISCLOSURE: If you purchase any lures or equipment using the links contained within this post then I may receive a percentage of the sale as part of an affiliate program. Using these links will not cost you any more than it would from purchasing directly from the website(s).